Nelia Alfano Moura (Brazil), recently appointed National Jumps Coach, has been working with National teams since 7990, attending events such as the Sydney 2000 Olympic Games, the World Championships in Seville 99 and Edmonton 2001 and the World Junior Championships in both Annecy 98 and Santiago 2000. He has coached at least one athlete to every Olympic Games since Seoul in 1988, and has produced 30 National Team athletes. He is an IAAF Level I Lecturer and has had more than 20 articles published in technical and scientific journals. Tania Fernandes de Paula Moura (Brazil) coached the Brazilian Team at the World Youth Championships in Debrecen-2001 and the World University Games in Beijing-2001, amongst other international championships. She has worked with many athletes who have competed internationally in the last few years, including Olympic athletes and one World Youth Champion. She coaches jumpers and works for the BM&F - Funilense Team. Brazil is the leading country in South American athletics, with the jumps events among our most successful disciplines. The top class results achieved by some Brazilian jumpers recently have been produced by a systematic approach, based on concepts firmly grounded on scientific data and modern methodological trends. 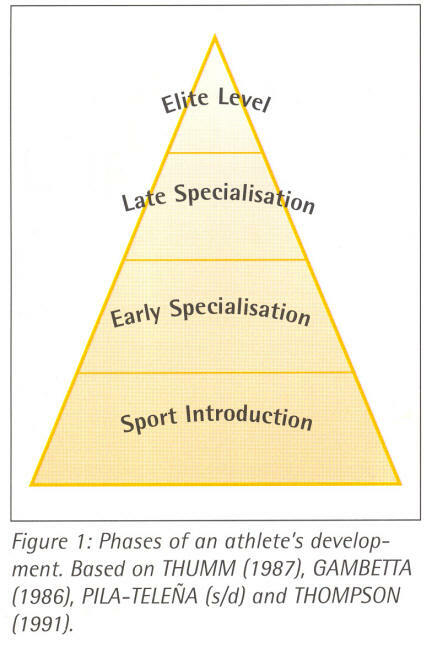 With special emphasis on special strength development, some of the most important principles we have developed in structuring training programmes for jumpers are: Short cycles in preference to longer ones in the annual training programme; Special strength training being done throughout the season, because training effects are absolutely specific; Quality of training (technique and power produced in each repetition) is far more important than quantity (tons lifted, or number of jumps performed). In South America, Brazil has for years been the leading country in athletics, and the horizontal jumps are among our best events. Despite that, track and field has not reached the level of popularity that we would like, and the number of youngsters involved in the sport is very low considering the huge population we have. However, even with the small numbers available to us, we have always been able to develop world class jumpers. 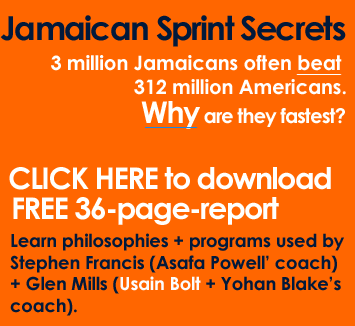 This tradition began in the 1950's with Adhemar Ferreira da Silva, one of the greatest triple jumpers in history. Da Silva was followed by Nelson Prudencio (Olympic silver medallist in 1968 and bronze medallist in 1972) and Joao Carlos de Oliveira (two Olympic bronze medals and World record holder for 10 years). We should also mention Anisio Silva (7th at 1993 WC), Nelson Ferreira Junior (5th at 1997 WC in the long jump) and Maurren Higa Maggi (1999 long jump World leader; 9th best jump all-time, with 7.26m; 1999 and 2001 World Championships finalist; 2001 World University and Goodwill Games Gold Medallist) as successful Brazilian jumpers. Our tradition in horizontal jumping events continues, with the young Jadel Gregorio (21 years old). World University Games bronze medallist, and the promising Thiago Carahyba Dias, who won the long jump in Debrecen, at the second World Youth Championships. We have the opportunity to work with many of these fine athletes, and we are convinced that these results have not been achieved by chance. 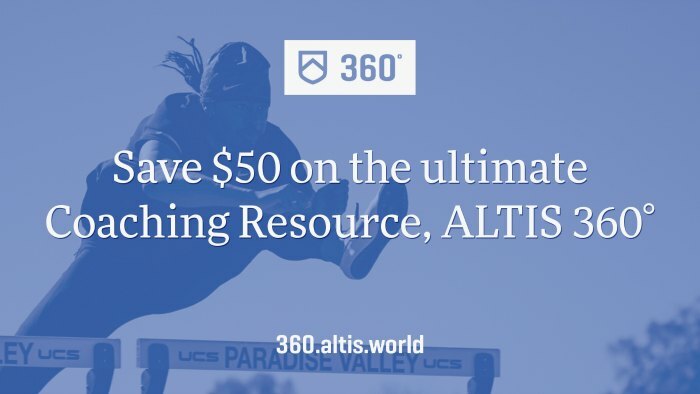 Within the space confines of this article, we will try to present an outline of the principles we have been following to guide the long term planning of our athletes' careers, and the implications for them of special strength development. We firmly believe in the statement that it takes 6 10 years to develop a high performance athlete (ARBEIT, 1998; PILATELENA, s/d). In order to be considered a high performance athlete, it is not enough to just produce a big jump you have to be consistent! On this basis, Maurren Maggi definitely belongs to such a group. On the other hand, Jadel Gregorio jumped in March 2001 a then World leading 17,13m. His second best jump was 16,48m at that time, so it was clear that, although very gifted, he had some work to do before joining this group. A string of good efforts (16,98m; 16,94m; 16,83m) topped by his bronze medal performance (16,92m) at the World University Games now allow us to include Gregorio among the best jumpers in the World. In order to guarantee future success, we need to plan the entire career of the athlete. We have done it splitting the entire process into phases, as can be seen in Figure 1 and table 1. ● General training can hamper the development of special capacities when it is done concurrently (DUDLEY & DJAMIL, 1985; HUNTER et al, 1987). 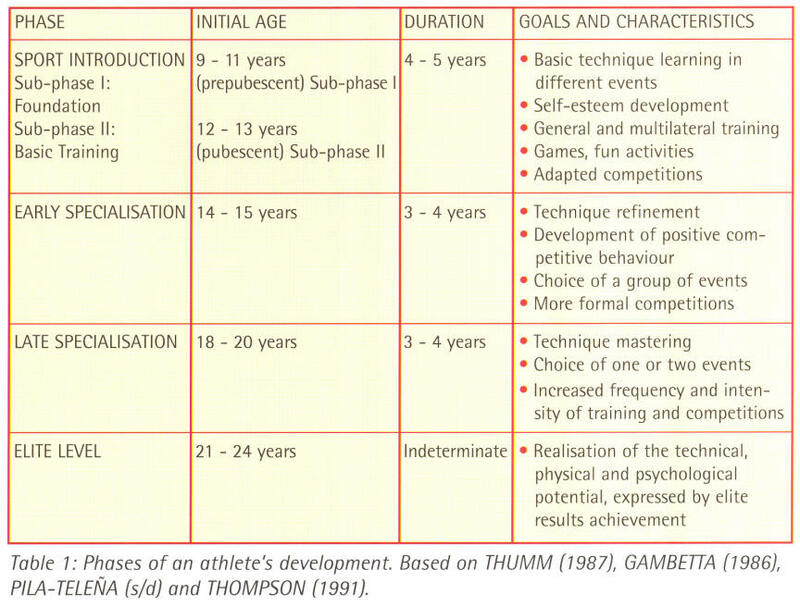 Therefore, high performance athletes should not try to develop general capacities beyond what is strictly necessary, and these capacities should be developed in the early stages of training. ● High performance athletes should be subjected to specific training all season long. 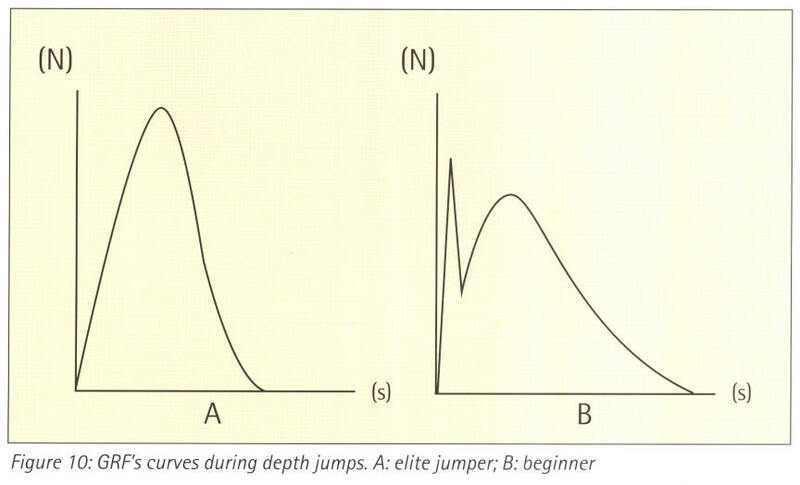 When we talk about jumpers, this specificity includes the choice of the best exercises, considering the type of strength and the goals to be reached (Figure 2). ● The training controls and prescription, taking into account the volume of work, have been overestimated. The proposed values usually found in the literature are too high to be done with quality in a drug-free environment. ● We can repeat the phases of training development (acquisition, maintenance, and temporary loss) more often than thought possible in the past. The formal structure with two competitive periods rigidly determined has been abandoned. Short cycles are better than long ones (TSCHIENE, 1989) to prevent over-training and performance stagnation provoked by the "complete adaptation" phenomenon (Figure 3). 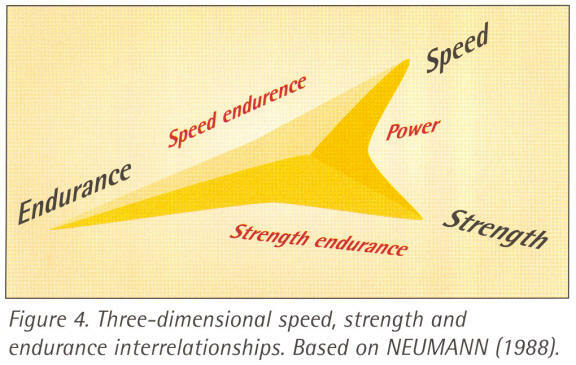 Strength is the capacity of skeletal muscle to produce maximal tension or force, at a given velocity. Any tension generated by the muscle has the tendency to shorten it, changing the joint angles and thus producing movement. Strength is a determining factor in jumping events, and can be manifested in different ways according to its speed and endurance interrelationships. (Figure 4). The most important strength aspects for jumpers are elastic and reactive strength, but proper levels of strength endurance and maximal strength should be developed to ensure a sound base is established for the improvement of special strength aspects and for the prevention of injuries. Even though the traditional approach of developing strength by following the sequence of strength endurance => maximal strength => special strength still dominates, new data shows that training transformations are not as straightforward as previously thought. In actual fact, when the stimulus to the development of strength endurance or maximal strength lasts more than eight consecutive weeks, deleterious effects on special strength (BOSCO, 1985) and on the muscle's microstructure (WIEMANN & TIDOW, 1995) can be noticed. On the other hand, ANDERSEN, SCHJERLING & SALTIN (2000) found that when muscles are subjected to a heavy weight training programme, the number of type lib fibres decreases (from 9% to about 2%), as they convert to type Ila fibres. However, after a period of detraining, rather than just returning to initial levels, the relative amount of llb fibres increases up to 18%. This data is very interesting, and justifies the use of heavy strength training for 6-9 weeks but no longer than that, in order to avoid type I fibre development. This should take place in the SPC block and also be repeated for the brief periods (2 or 3 weeks) during the year devoted to the development or maintenance of maximal strength. A tapering phase will later on provide an opportunity to reconvert Ila muscle fibres into faster llb types. The complex or contrast training method has become increasingly popular among jumpers, and most strength training programmes that we use follow this principle. This method tries to increase the possibility of transference of the effects in the direction of the real competitive situation, playing with the central nervous system by varying the type and intensity of the stimulus. Another interesting concept hypergravity was introduced by BOSCO (1985b), and SANDS & co-workers (1996) corroborated his results. Their work indicated that special weighted clothes bring important benefits to power events specialists, which gives support to the inclusion of this procedure in the preparation of jumpers. It has been clearly shown that motor units recruitment follows a sequence where the small units (type l fibres) are recruited first, and they are then progressively followed by bigger units (types Ila and llb). Even at the early stages of a maximal muscle action, type l fibres are recruited first. (Figure 5). However, there are exceptions to this principle and it is very important that they are known by the coach. BOSCO (1985a) noticed a negative relationship between the development of maximal strength and special strength in elite Italian jumpers. Even though he did not suggest eliminating maximal strength training, he recommended limiting the duration of this training period to a maximum of 8 weeks. He justified that by the fact that after 8 weeks, undesired ultrastructural changes in the muscles can be seen, such as a hypertrophy of Type I fibres which will hamper elite performance (Figure 6). Before such changes happen, other training methods able to develop type II fibres (mainly lib) should replace maximal strength methods. High velocity eccentric activity shows a recruitment pattern that is exactly the opposite to what is explained above, something that is also true for trained ballistic activities. It seems type II fibres are first recruited in these cases because they need less time to relax after the action, which is necessary for better control during fast eccentric actions (HOWELL, 1995). Plyometric training offers a way to improve strength and muscle power with a selective recruitment of type lib fibres, so it has an important place in our programme. Usually, training leads to a rapid gain in strength in the early stages, without increases in muscle mass. This initial adaptation can be explained by better recruitment patterns of motor units, and is called neural adaptation (learning). The selective recruitment of a higher number of motor units (mostly Type llb), activated at a higher frequency, and with good synchronisation, is the answer neurologically to gaining greater strength and muscle power (SALE, 1992). 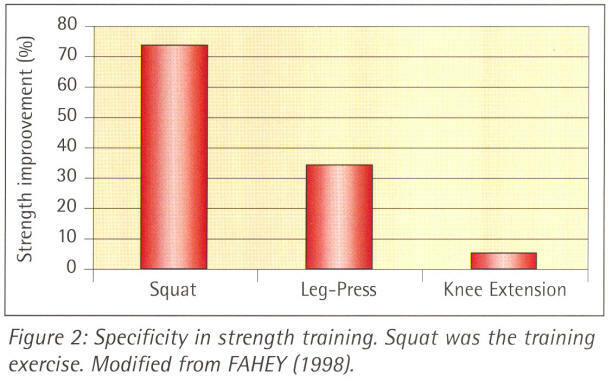 Structural adaptation (hypertrophy) occurs later, as a result of prolonged strength training. 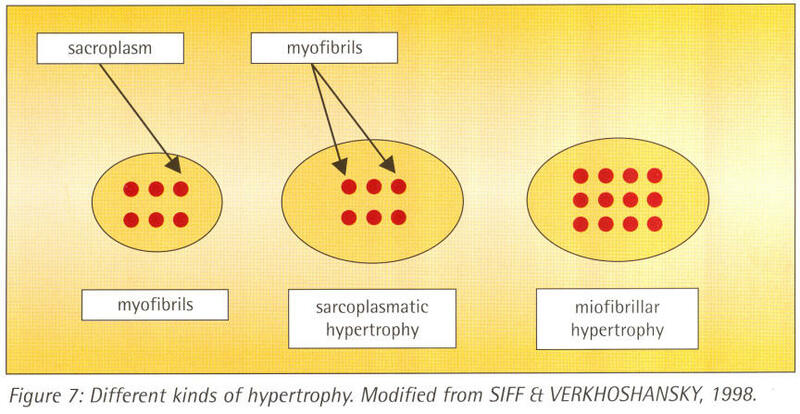 Hypertrophy can be selective (only in certain types of motor units, accordingly with training emphasis), and can be the result of increased amounts of non-contractile (sarcoplasmatic) and/or contractile proteins (myofibrillar) (SIFF & VERKHOSHANSKY, 1998) (Figure 7). We can find in the literature an interesting response to maximal voluntary contractions (MVC) known as post-tetanic potentiation (SIFF & VERKHOSHANSKY, 1998; GÜLLICH & SCHMIDTBLEICHER, 1996). When a muscle does a maximal isometric action for about 5 seconds, there is a reduction in its explosive strength that lasts a few minutes. After that, a facilitating phenomenon occurs, and the explosive strength potential is significantly increased. New studies are necessary to define a protocol for MVC during competition warm-up, but this offers some exciting possibilities for the specialists in power events. Since the 60s, coaches and scientists around the world have been searching for training means and methods to improve the storage and reuse of elastic energy in skeletal muscle during the stretch-shortening cycle (SSC). The so-called plyometric exercises are able to do that. They are defined as exercises that "activate the stretch-shortening cycle of skeletal muscles, inducing the elastic, reflex and mechanical potentiation" (MOURA, 1988). Several factors interfere with this potentiation, changing the capacity to generate positive work during SSC. Among them, the most important are the amplitude and speed of the eccentric phase, as well as the coupling time between the eccentric and concentric phases (CAVAGNA, 1977). The most favourable situation in track and field combines a small amplitude with high speed in the eccentric phase and a short coupling time. Depth jumping, and its many variations, are the most popular plyometric exercises designed to improve explosive strength in the lower limbs (Figure 8). The drop height determines the eccentric load, and its control is very important. Even though recommendations of drop heights from 0.38m to more than 2.00m can be found in the literature (LUNDIN, 1985). most authors believe in the concept of "optimal height". NASSER (1990) claims that drop jump tests are usually applied by coaches, whereby they successively increase the fall height and stop when the height of the jump after the fall ceases to increase. The optimal height for training is considered to be the one that allows the best jump after the free fall (BOSCO, 1985a). Figure 9 shows the results of a female long jumper (personal record = 6.20 m) doing drop jumps from heights of 20, 40, 60 and 80 cm. 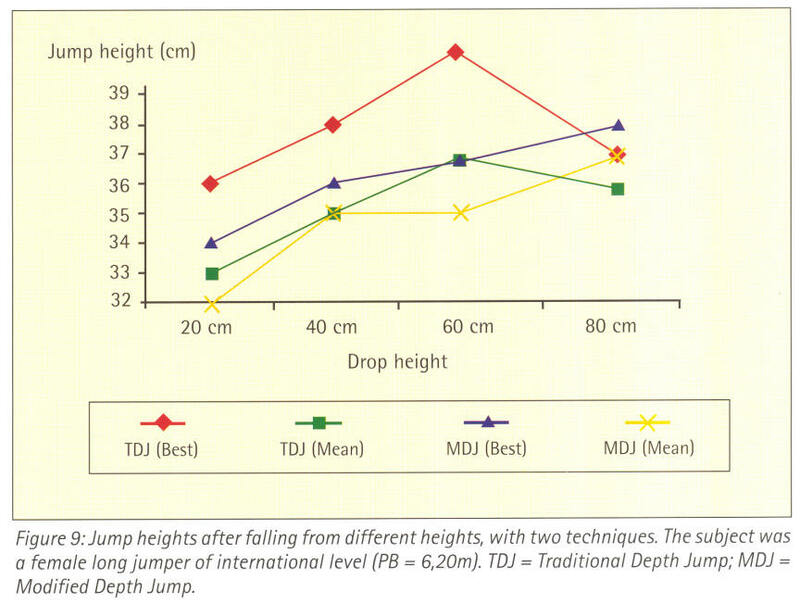 In this situation, a fall from 60 cm was optimal for a traditional depth jump, and 80 cm for the modified depth jump (MOURA, 1993). However, other issues should be taken in account when we choose the best eccentric load for each athlete. Figure 10 shows two curves of ground reaction forces (GRF) obtained during depth jumps. Curve A was generated by the jumper mentioned above and curve B by a beginner. We can notice that the shapes of these two curves are very different from each other. The most important difference is the first peak showed in the beginner's curve. This peak represents the passive forces, and is not seen in the elite jumper's curve. High passive forces have a great potential to lead to injury, and do not contribute to performance. The second peak represents the active forces. The passive peak in depth jumps is associated with heel contact with the ground so, if the athlete touches the ground with the heel after the drop, the height achieved will be reduced. When this measure is not enough to guarantee that the heels do not touch the ground, the use of depth jumps in training should be postponed. 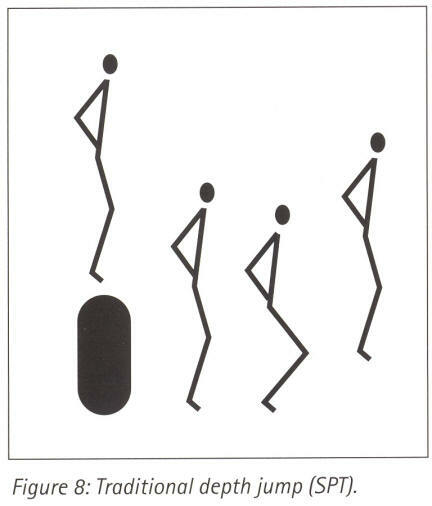 (MOURA,1994). 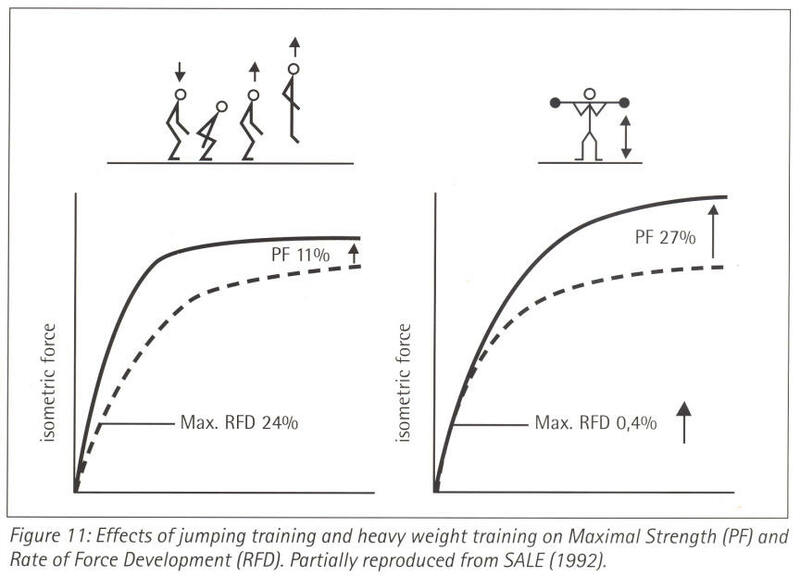 Even though plyometric training should not replace weight training (actually, both should co-exist in the special strength development of jumpers), its variations are far more effective to develop the RFD (rate of force development) one of the most important components of special strength for this population than the use of heavy weights (Figure 11). The classical work done by Hill shows the inverse relationship between force produced by the muscle and its shortening speed, both in isolated and "in-vivo" muscle. 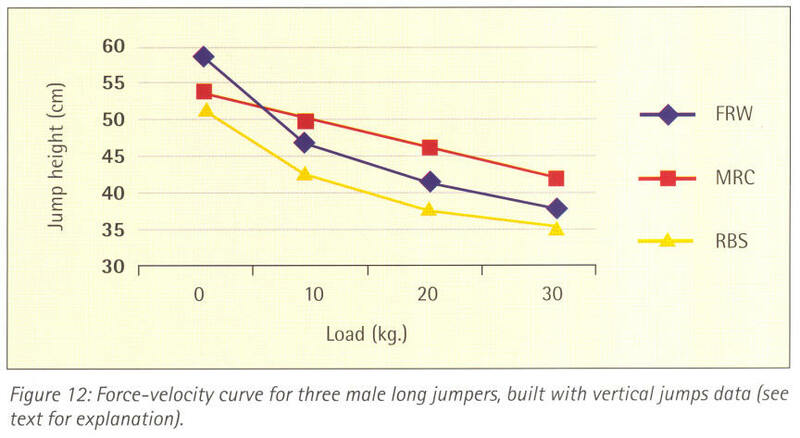 Figure12 shows this curve, easily reproduced through the use of vertical jumps with increasing loads. Three long jumpers, of national and international level (personal bests: 8.00m, 7.44m and 7.44m) performed vertical jumps with loads from 0 to 30 kg. It is clearly shown that performance decreases when the load increases, which is absolutely predictable. On closer observation, even more interesting information emerges. Both FRW and MRC are in inverted positions at the two extremes of the curve, showing they have different characteristics of explosive strength. Individual characteristics or a different training orientation can explain this difference. It is known that training displaces each point of the curve upward and to the right, but it also modifies the shape of the curve, changing some aspects more than others. A longitudinal follow-up can show if training is balanced or if it is influencing any of the components of explosive strength in the wrong way. Strength training with jumps event specialists should have the aim of developing maximal power within a very short time frame. 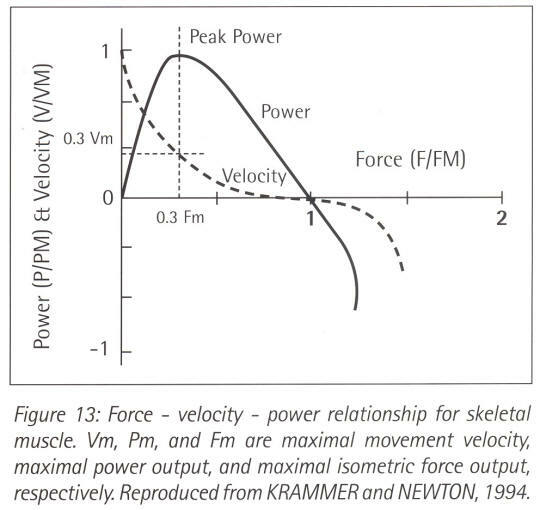 Figure 13 shows the force-velocity-power relationships, and makes clear that in order to develop power, loads must be optimal, not maximal. 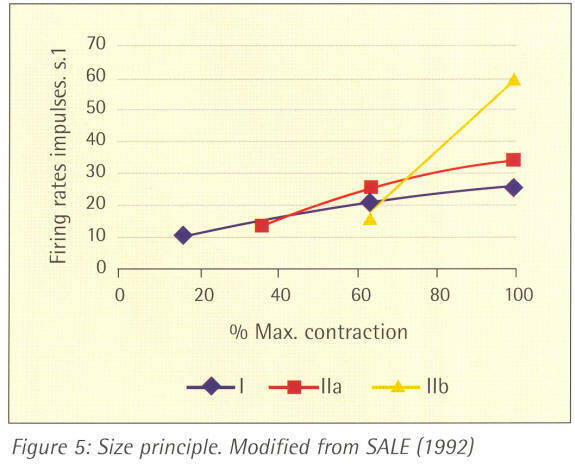 BOSCO (1991) suggests the use of loads equivalent to 35-40% of 1 RM, which allows the expression of 35-45% of the maximal velocity of the same unloaded movement. When heavy loads are used, and the bar velocity is low, it is important to try to move the bar as fast as possible. YOUNG and BILBY (1993) have demonstrated that the intention to move the bar fast, is as important as the actual speed of the bar if our aim is to develop power. RITZDORF (1998) suggests that decreasing the external loads when performing jumps is a good stimulus to develop the velocity component of explosive strength. He says that new, predominantly fast, motor programmes can be developed with the systematic use of some specific facilitation methods (like external pull supports), and that these speed based programmes can then be reproduced when the facilitation is removed. Even athletes who are predominantly fast, (but without a good level of strength), could lose some characteristics of their fast motor programmes if they do not have the opportunity to train them, due to a poor level of physical conditioning. We use surgical tubes attached to belts to create a vertical traction that decreases the weight of the jumper, so he can jump with very short contact times and produce high muscle shortening speed. This is a method that provokes a central nervous learning effect and so can be beneficially used by athletes of all age groups it is a special method but should not be restricted to elite athletes. 3. Quality of training (technique and power produced in each repetition) is far more important than quantity (tons lifted, or number of jumps performed).